Holidays are the perfect time to gather with friends and family, enjoy delicious food, and relax with some brews. Cinco de Mayo is right around the corner and while I used to celebrate by going out to bars, now I’d much rather host a gathering at my home. 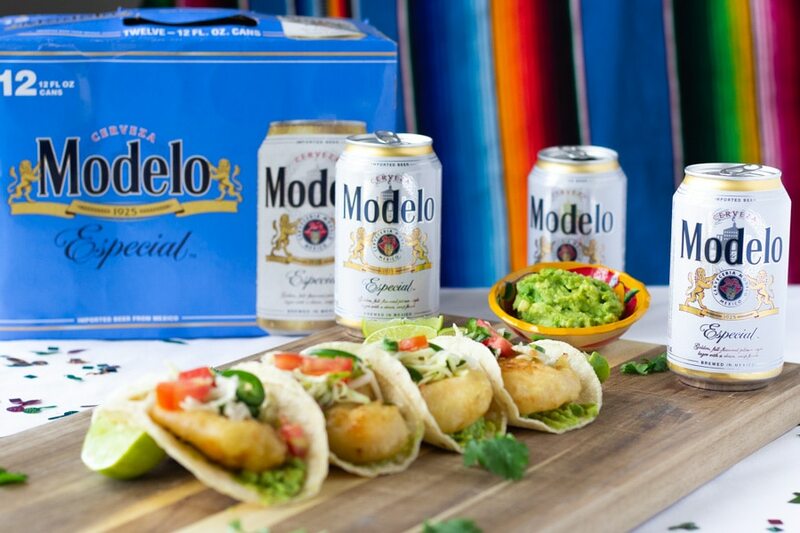 If you’re like me and prefer to host at home, than you know that no Mexican fiesta is complete without some ice cold cervezas like Modelo Especial for you and your guests. 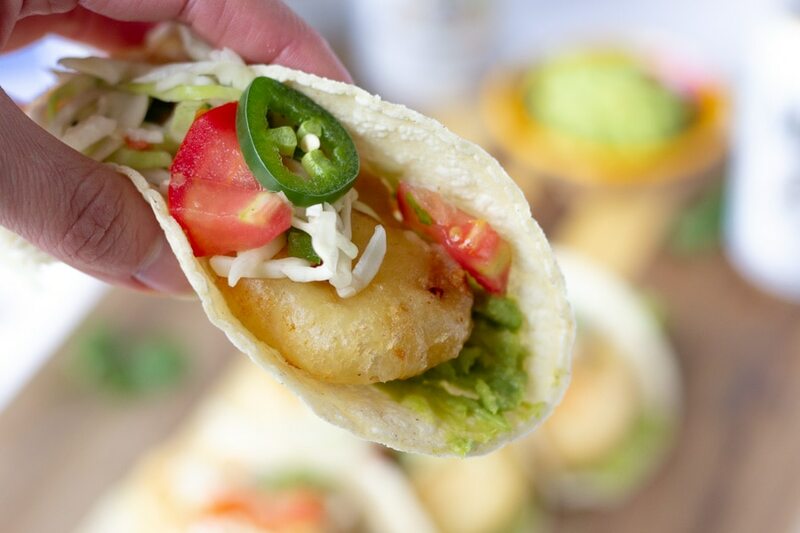 The crisp, refreshing taste of Modelo is the perfect accompaniment for these shrimp tacos—which are also made with a crunchy Modelo beer batter. I typically don’t like to make fried foods, but parties and holidays are always the exception. Flour, Modelo Especial, salt and pepper. That’s it! I love how using Modelo in the batter makes for a crispy crust but doesn’t feel too heavy on the shrimp. And this same batter and technique can be used to fry fish as well. Dredge shrimp in seasoned flour, then dip in beer batter. Place in hot oil and fry each side for 2-3 minutes or until golden brown. You don’t need any fancy equipment to fry the shrimp. I used a heavy bottomed saucepan over my stove and it worked just fine. You will need a high-heat frying oil like canola, peanut, or grapeseed. Don’t these shrimp look scrumptious! I used jumbo shrimp for the tacos and 2 shrimp per taco were perfect! 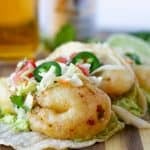 These Beer Battered shrimp tacos are paired with creamy guacamole and topped with a spicy lime slaw. 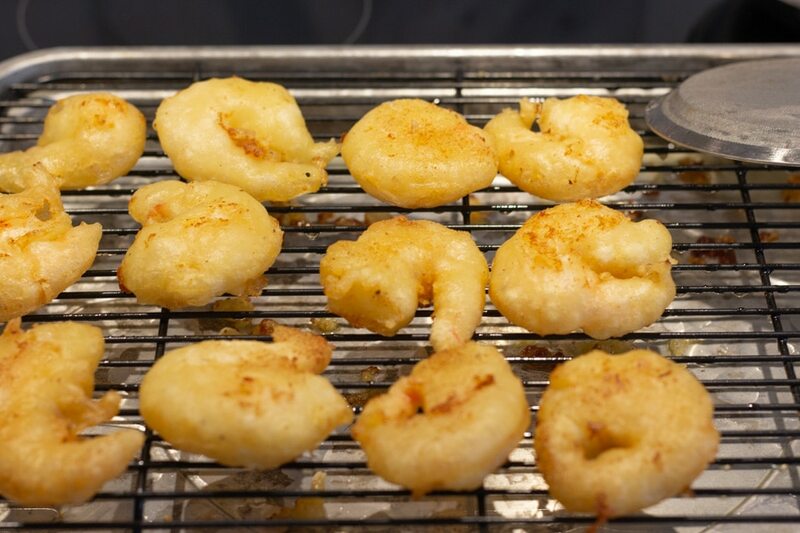 You can even fry the shrimp a couple of hours before your party and reheat them in the oven to keep them crunchy. It’s pretty special how Cinco de Mayo has turned into a big celebration here in the US. There’s a common misconception that Cinco de Mayo is Mexican Independence Day, but it’s actually the day that Mexico won the Battle of Pueblo: a significant victory for Mexico over France. While May 5 is a significant day in Mexico’s heritage, September 16, Mexican Independence day, is more popular in Mexico. Cinco de Mayo is widely celebrated here in the US and is the perfect time to embrace Mexican culture by having a fun party with your friends. Having your own party means you don’t have to battle crowds at the local cantina. 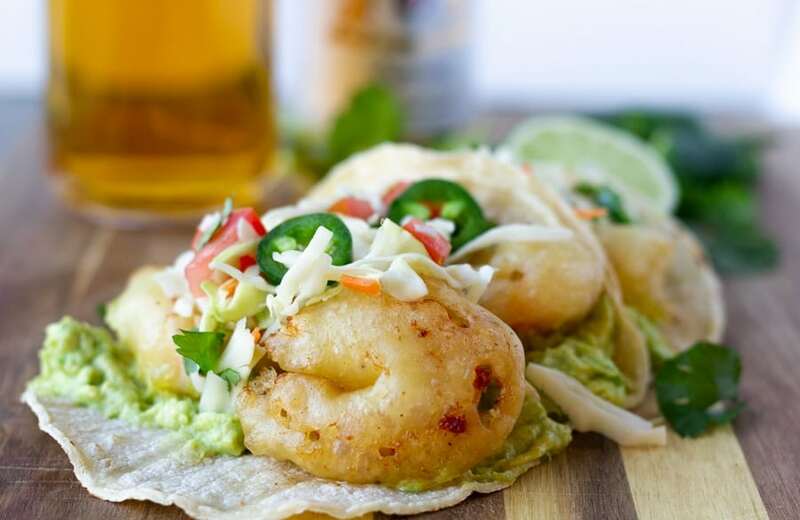 Impress your guests with these Beer Battered Shrimp Tacos, and don’t forget to stock your ice chests with Modelo Especial to complete the Mexican ensemble. Ready. Set. Cinco! Click on the button below to add all of my recipe’s ingredients to your shopping cart! Mix all ingredients for Slaw and set in the refrigerator. You can make a couple hours ahead of time if needed. Heat a heavy bottomed sauce pan with oil, enough to cover shrimp. The temperature should be 350 degrees. Have a slotted spoon and rack to place shrimp on once it's been fried to cool down. If shrimp is frozen, defrost and pat dry with paper towels. 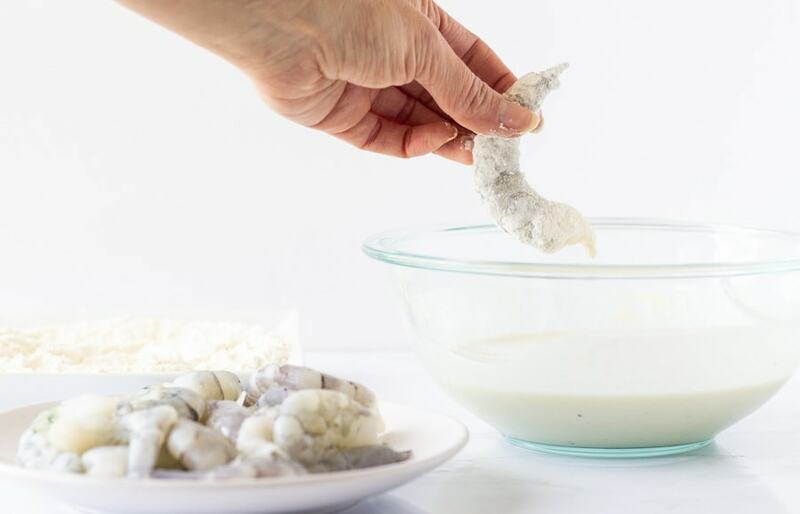 Mix 1/2 cup AP flour with salt and pepper to dredge shrimp before dipping into beer batter. 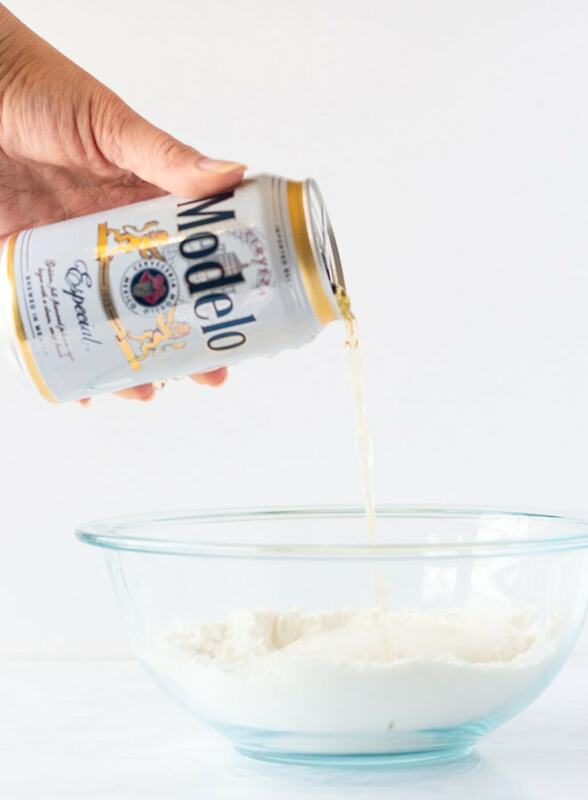 For the beer batter, mix flour, salt, pepper, cold Modelo Especial, and stir with a whisk until combined. 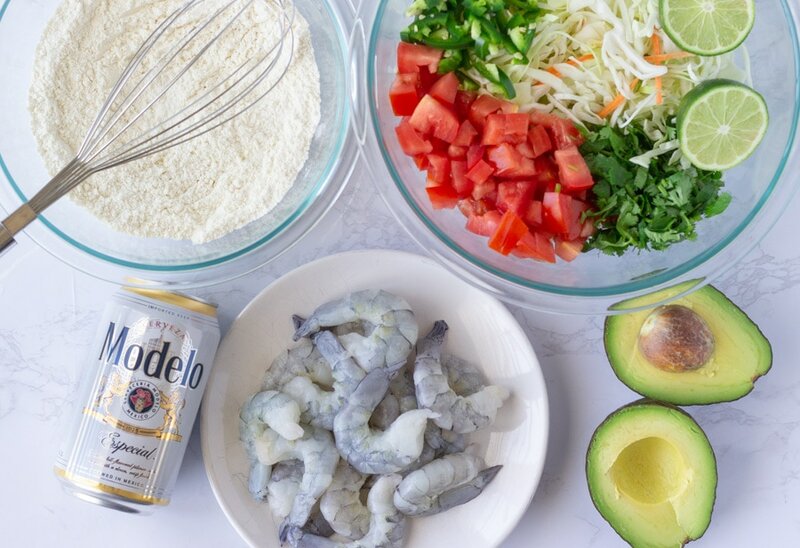 You can drink the remaining Modelo 😉 Dip floured shrimp into beer batter using fingers or a fork for less mess. Carefully place into hot oil and fry 3-4 minutes on each side or until golden brown. For guacamole, smash 2 ripe avocados with 1/2 of lime juiced, and salt. Mix well and set aside in a bowl. To assemble tacos, heat tortillas in oven or skillet till warmed. I like mine with some brown spots. 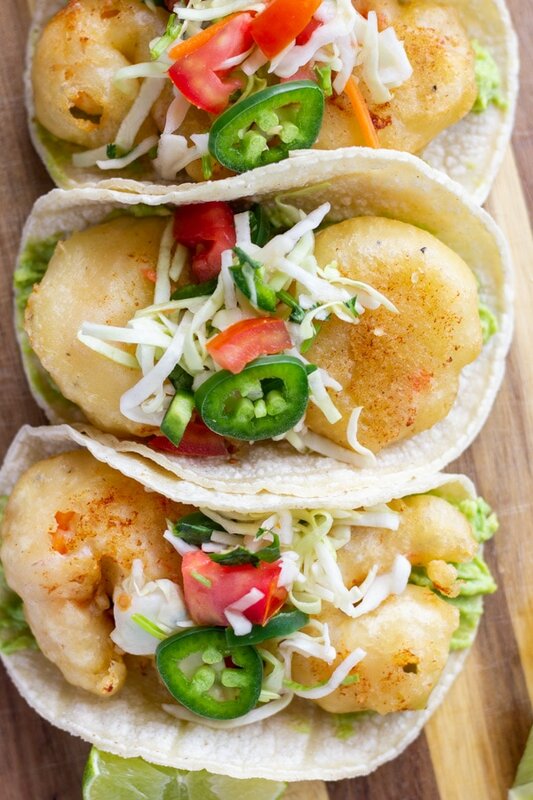 Place a layer of guacamole on the bottom of the tortillas, add 2 beer battered fried shrimps, and top with slaw. 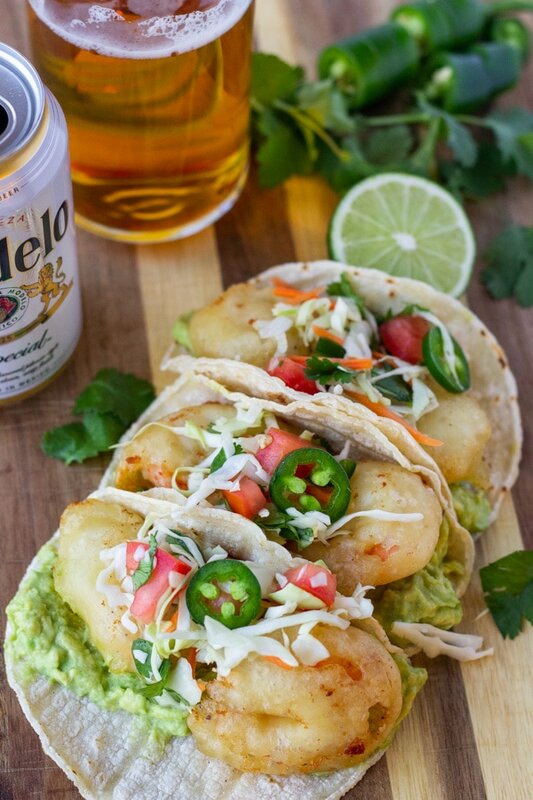 Serve with extra lime wedges, sliced jalapenos, and of course, ice cold Modelo Especial. Cheers! !